A lecturer should … give them [the audience] full reason to believe that all his powers have been exerted for their pleasure and instruction. In Letter to his friend Benjamin Abbott (11 Jun 1813), collected in Bence Jones, Life and Letters of Faraday, Vol. 1, 73. Faraday was age 21, less than a year since completing his bookbinder apprenticeship, and had decided upon “giving up trade and taking to science.” From several letters, various opinions about lecturing were gathered in an article, 'Faraday on Scientific Lecturing', Norman Locker (ed. ), Nature (23 Oct 1873), 8, 524. For the first time in our national history the higher-education enterprise that we pass on to our children and grandchildren will be less healthy, less able to respond to national needs … than the enterprise that we ourselves inherited. I cannot answer your question, because I have not yet read that chapter in the textbook myself, but if you will come to me tomorrow I shall then have read it, and may be able to answer you. In reply to a student’s question after a lecture. As given in quotation marks in T. Brailsford Robertson, The Spirit of Research (1931), Vol. 1, 161. Note: Robertson worked in Loeb’s lab, and may be giving a recollection in his own words, rather than a verbatim quote. In science, as in life, learning and knowledge are distinct, and the study of things, and not of books, is the source of the latter. In 'On The Study of Zoology', Lay Sermons, Addresses, and Reviews (1870), 112. Maybe the situation is hopeless. Television is just the wrong medium, at least in prime time, to teach science. I think it is hopeless if it insists on behaving like television… The people who produce these programs always respond to such complaints by insisting that no one would watch a program consisting of real scientists giving real lectures to real students. If they are right, then this sort of program is just another form of entertainment. Science may be learned by rote, but Wisdom not. (1759). From The Life and Opinions of Tristram Shandy, Gentleman, collected in Collection of Ancient and Modern British Novels and Romances (1832), Vol. 38, 311. Science must be taught well, if a student is to understand the coming decades he must live through. 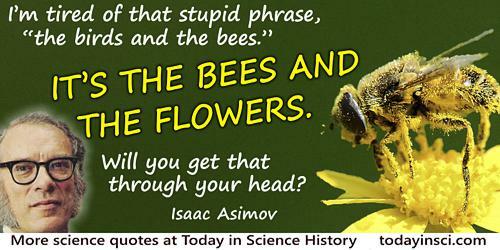 Epigraph in Isaac Asimov’s Book of Science and Nature Quotations (1988), 255. 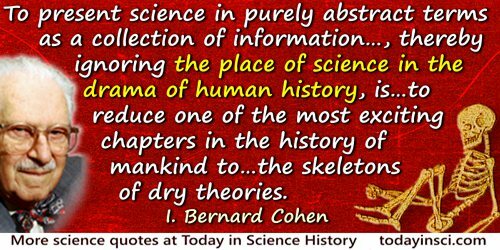 To present science in purely abstract terms as a collection of information or as a system of knowledge, thereby ignoring the place of science in the drama of human history, is simply to rob the students of their own heritage as human beings and to reduce one of the most exciting chapters in the history of mankind to the bare bones of observed fact and the skeletons of dry theories built of them. From 'The History of Science and the Teaching of Science', collected in I.B. Cohen and F.G. Watson(eds. ), General Education in Science (1952), 72. We don’t teach our students enough of the intellectual content of experiments—their novelty and their capacity for opening new fields… . My own view is that you take these things personally. You do an experiment because your own philosophy makes you want to know the result. It’s too hard, and life is too short, to spend your time doing something because someone else has said it’s important. You must feel the thing yourself—feel that it will change your outlook and your way of life. In Bernstein, 'Profiles: Physicists: I', The New Yorker (13 Oct 1975), 108.